Architect Vittorio Longheu designed C House in Vicenza, Italy, as an abstract composition of volumes with different materials that represent the various living spaces. 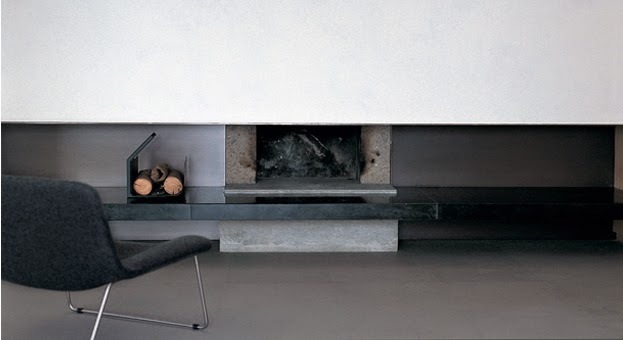 Walls of stone, plaster and wood define the minimalistic materials’ pallete. Large terraces and sliding windows that hide completely into the walls when opened relate the house with its landscape, focusing on the simplicity of space. "This place is inspiring, full of suggestions and references. It can be reached through a narrow slope derived from the construction of an embankment. At the rear of the property, the land becomes more and more steep, where you will encounter a first high embankment that defines the property to the south. A second embankment just above the first and the third very high wall that defines the property to the north and an alternation of flat and sloping areas. Looking at the territory you understand immediately that this image coincides with the construction of the landscape in a succession of walls and meadows, woods and hills to draw up the slope to the plain. The idea of the project will compare with the first image, probably the strongest. The project takes shape from the composition of elementary volumes that are assigned through the use of different materials, which has the task of representing the various places of living. Walls of stone, plaster and wood are the materials that describe the composition of volumes, the presence of different spaces and places. 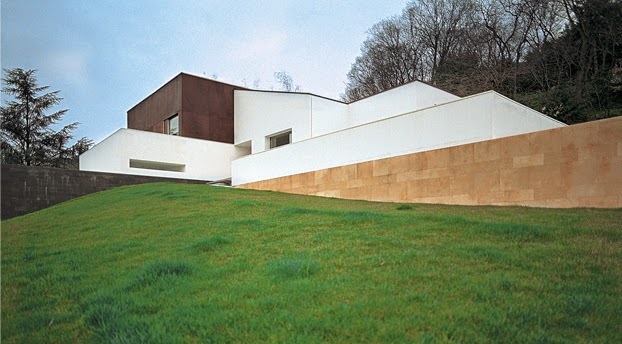 At the bottom of the house with sloping ground, It is defined to coincide with a basement or topological idea where the stone are measures the connection between house and slope. 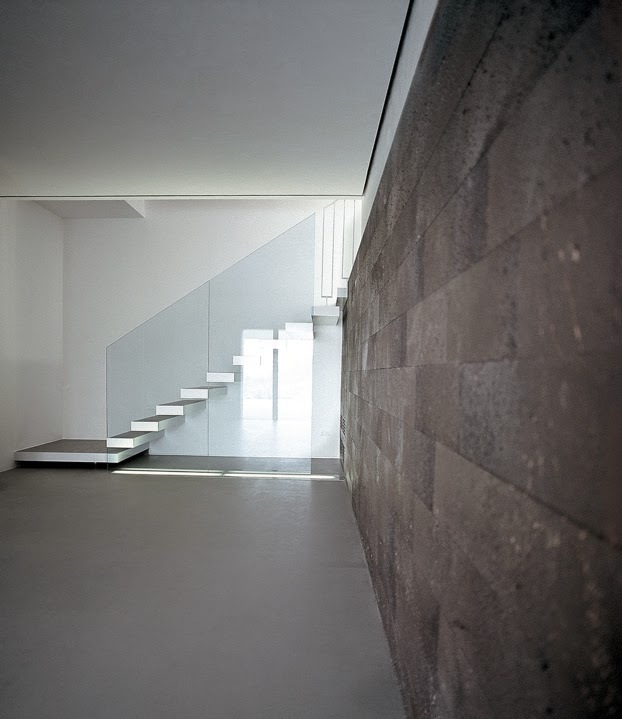 The stone basement becomes an element of interpretation and also the signs of continuity with the territory. It does not represent a privileged place in the house, it is the service areas, but it tells us about the design of a section of the house. The house refuse any mimetic attitudes to natural world, the composition is no exception to grapple with us the issues of domestic architecture. 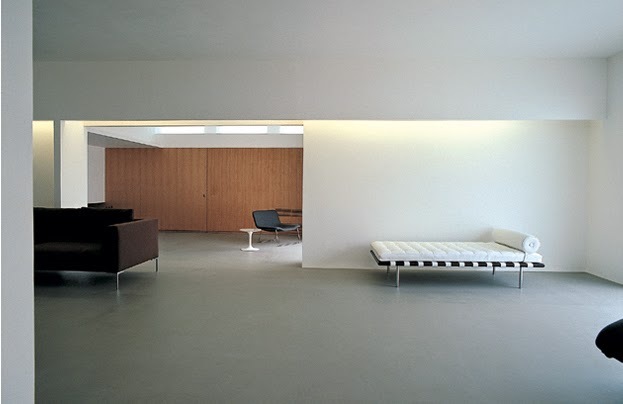 The wall and window represents its connection as well as the sloping roof that connects the volume of the living area with one of the rooms. 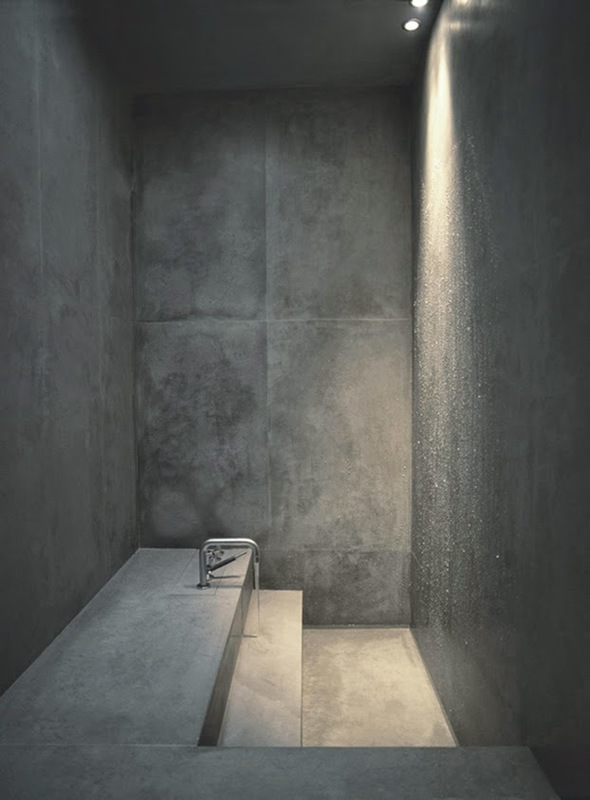 The use of different materials coincides with the representation of these two places, distinct in the composition of the interior spaces and otherwise described in volumetric composition. 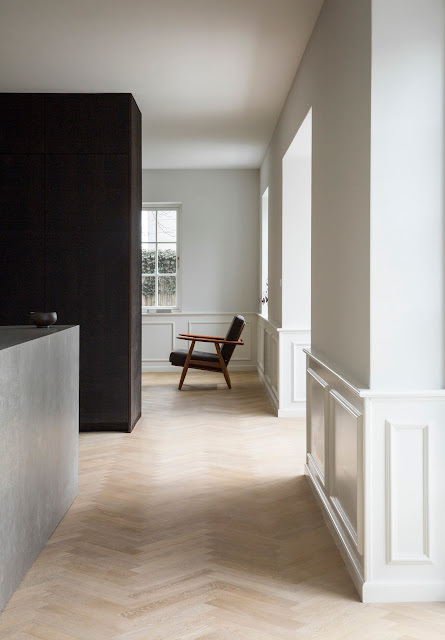 The public spaces of the house are built with white, neutral and carved volumes, marked by light and dark shades with the opening of windows and logge. The volume of the bedrooms, covered with oak, is a warm and welcoming place, peaceful and familiar. This stereometric volume, almost shadow less, represents a basic configuration described by the flow of the soft light on the surface. 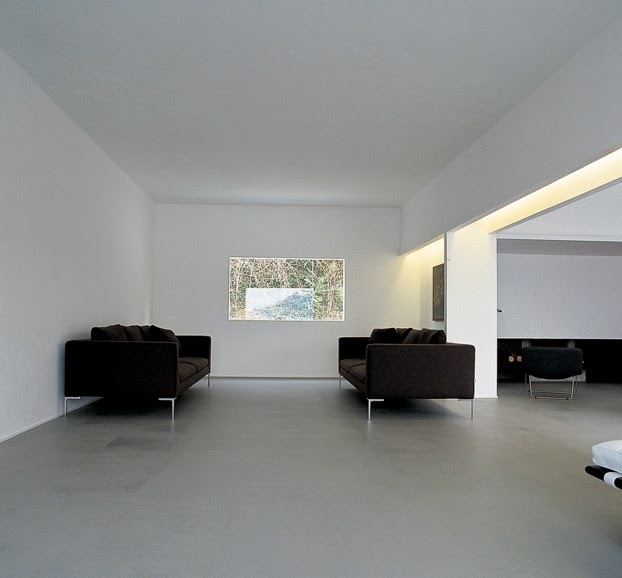 Unlike living area, the stone which define the basement, is divided into a composition of whitewashed parts which give a black and white effect. The story of these spaces was born from a relationship of empathy between the places of the landscape and the spaces of the house. It is defined in a series of spatial relationships linked by a narrative principle that binds the different living areas and the sleeping area measured in a sequence of walls and thresholds. The house is also open in its relationship with the landscape through the construction of large terraces placed in relationship with the living room, the dining room and the music room. 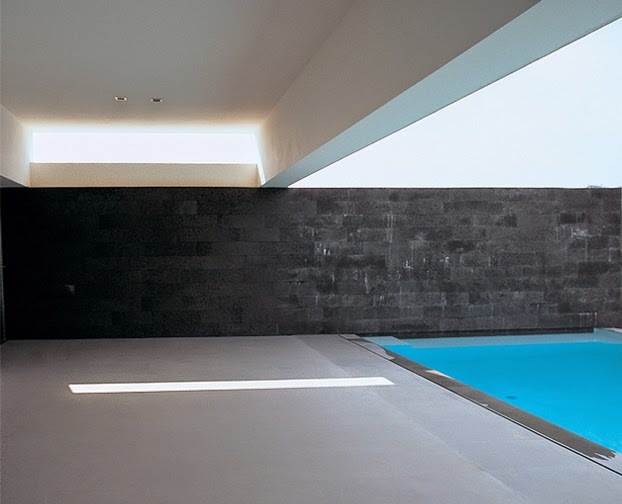 The studio has a small courtyard dedicated to reading and contemplation, but the place that best represents the passage of other volumes of the interior to the nature is the lodge and then the pool. This is at the same time open but covered. 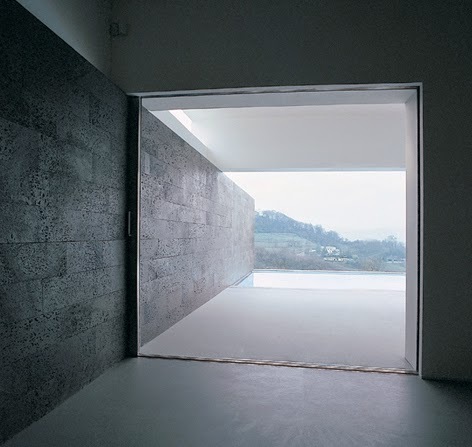 It is built with a long room and deep enough to be comfortably and characterized by a large horizontal opening that draws a panoramic view of the landscape, just two meters high, which draws a panoramic view of the landscape. The relationship with nature and the relationship between the interior and exterior of the house are designed in a seamless drawing the frames of the doors along the terraces and loggia of the steel sliding recessed ceiling and floor. The window is then completely hidden in the wall and looking out you can see the hole in the masonry and glass. 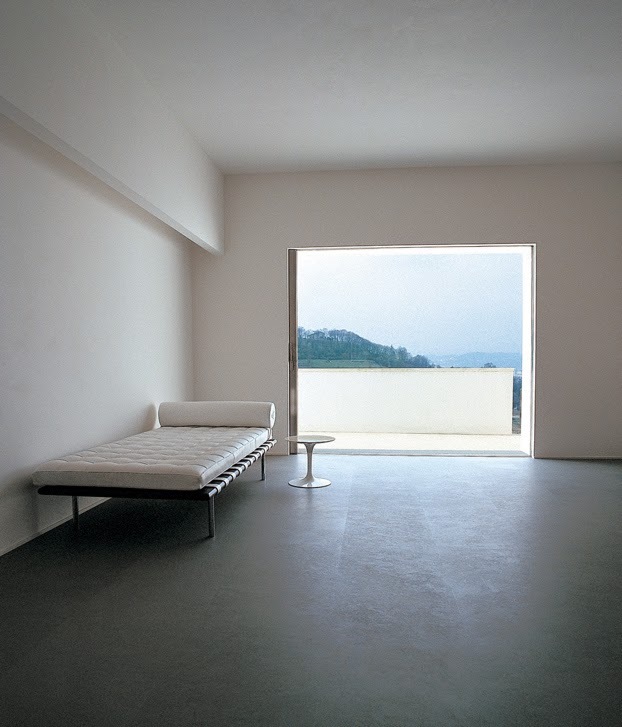 The simplicity of the space within becomes the theme with which to read and interpret the landscape and this seems to be the character of this house, the purpose for which it was built, the representation of the emotion that space arouses entering it, the vacuum emotional who takes a moment to reason and its relationship with the infinite variation of nature and landscape. If the project is indifferent in respect to the land on which it rests, it leaves a sterile and poor result, and has its origin in two causes on one hand, the culture of the autonomous ‘architectural object’, stripped of all physical or cultural dependence; and on the other hand, the absence of work from the section, which reveals a way of understanding the project not as a whole, with a spatial dimension, but rather as a development on floor plan, based on a strictly geometrical exercise, the result of a simplification or misinterpretation of modernity by which the diagram of uses would acquire, as tool, a substantial condition. The section is no longer used as much as starting point, and this reduces the capacity to appreciate or to generate, in the project process, topographies that are able to enrich it and to create spatial connections with the landscape or the city. 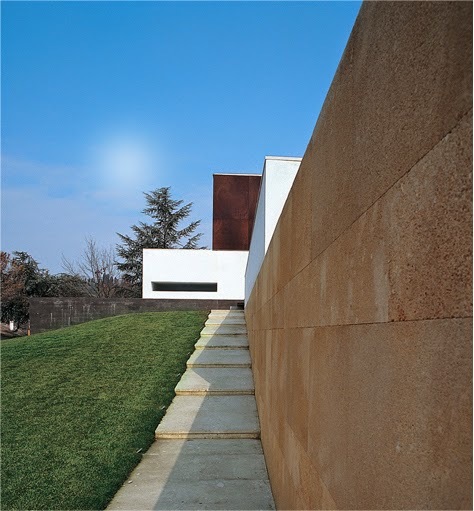 In the project for House C in Vicenza, topography has an instrumental character. It not only helps to moderate the presence of the volumes required in brief and to generate interior sections and spaces, but it also becomes a means to establish a relationship with reality of the place. 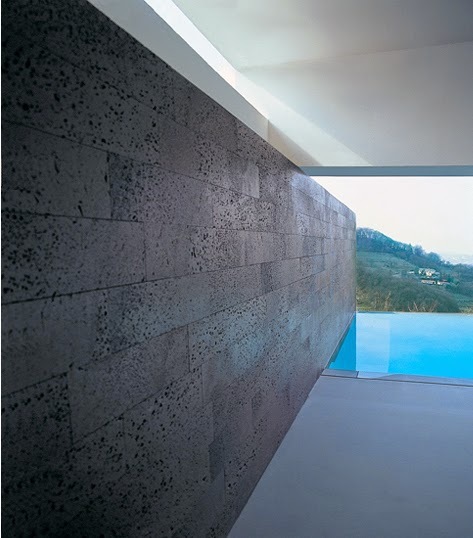 A place where horizontality, naturalness, weight and attachment to the walls of lime stone are the essence of the landscape. 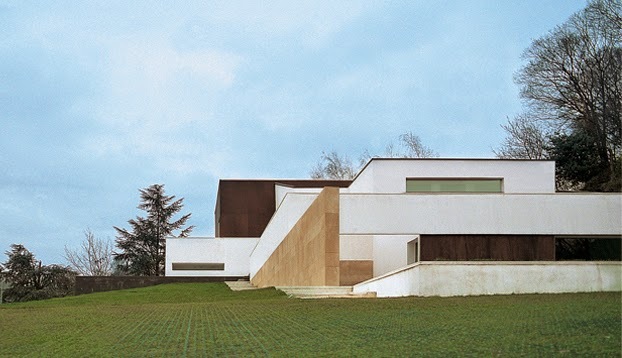 The wall of lime stone blend into the building to the point that the architecture of the house is connected with the landscape. For this reason it mustn’t be confused with nature but we must try to creative concise relationship between the artificial and natural forms. 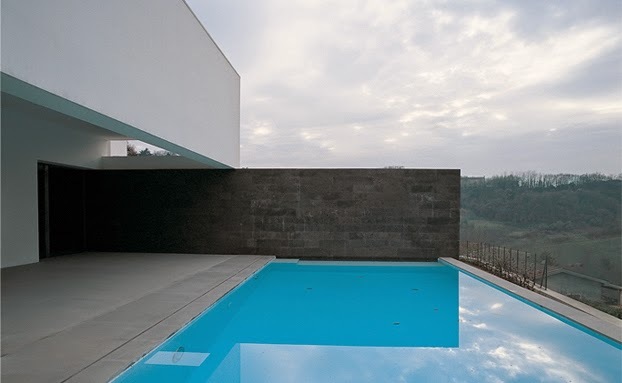 House C in Vicenza, on Berico hills, a place of great natural beauty, where the timeless architecture of the farmhouses, are compact and precise, shares this idea of establishing a respectful relationship with the natural environment, haven though it still expressing their architectural condition. The use of clean forms and volumes, such as those of the roofs, or based on agrarian building types, has allowed us to keep an approach that only apparently seems to dominate this site."